Fresh eggs have returned to the farm! With the increased number of eggs, comes the hunt for new ways to use them. This was an incredible find and definitely share worthy. Portabello caps, a drizzle of speciality olive oils, fresh eggs with golden yolks and garden fresh basil roasted to perfection. We had fresh mozzarella on the side, tonight, but I think next time we will shred it right on top before roasting. Cover baking sheet with foil and spray with non-stick cooking spray. Place mushroom caps and drizzle lightly with both olive oils. (A hint here: a few drops of the flavor infused oil goes a long way, don’t over-do it.) 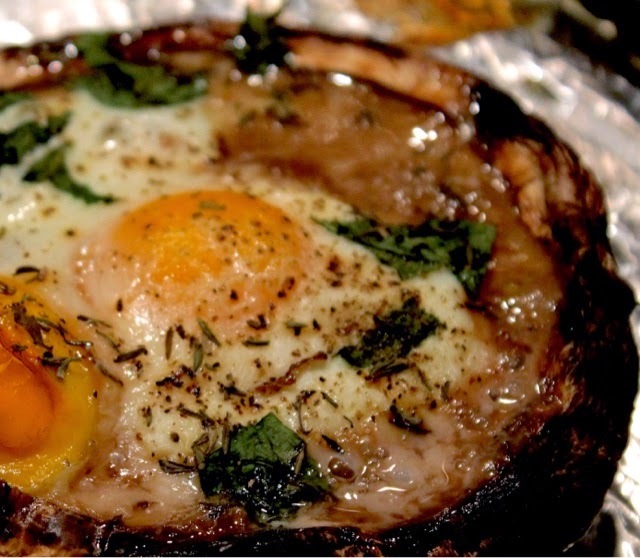 Crack egg in separate dish, then pour gently into mushroom cap without breaking yolk. (This is easy with fresh eggs.). Large Portabellos will take more than one egg. Our eggs are still small so we used 2-3 for each cap. Add fresh basil, sprinkle with thyme, salt and pepper. Place in 300 degree oven for 12-25 minutes depending on size of mushrooms and filling. We cooked them long enough to cook the yolks through. The bigger mushrooms did accumulate a bit of moisture in the cap as the mushroom cooked down, I simply drained it before placing on the serving dish. This is great for a hearty meal on a meatless night. I am already thinking of foods to add for variations of it – sautéed asparagus spears? Bacon? Sun roasted tomatoes? Capers served with cool cucumber sauce on the side? Oh yes! This is a good one! 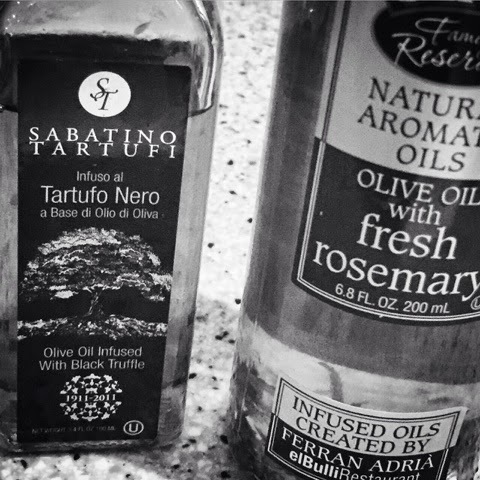 These are my olive oil favorites. The truffle oil is difficult to find outside of a specialty gourmet shop (or Amazon) and a peek at the price tag may send you in the opposite direction with empty hands thinking that it’s not worth it. I’m here to tell you, it’s worth every cent and a little goes a long way. There is a reason the spice trade has been going on since 3000 BC – spices, herbs and seasoning turn “average” into AMAZING. Be brave, take risks, try new tastes.